Paulina has loved animals since a very young age and always wanted to work with them professionally. This option did not really exist in Mexico at that time so she studied advertising and graduated with a Bachelor of Arts. 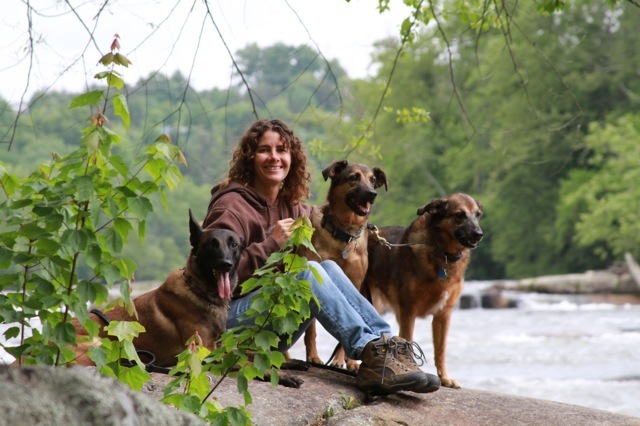 After 5 years in the ad business in 1993 she returned to her first love and dedicated herself full-time working with dogs. Never one to stop learning, she enrolled in a program given by the American College of Applied Science to become a Certified Companion Animal Behavior Counselor and she also continues her avid study of dog behavior and training by regularly attending seminars. Agility is her new hobby. She is planning to compete soon with her dog Cronos. She also share her life with her two mexican mix-rescue Gea and Venus. Paulina’s focus is on the day-to-day life of the dog and his family and all that entails. From puppy selection to advance obedience, from helping a shelter dog to adapt to his new home to teaching the family to adapt to him. She’s always wanted to help the situation of the ‘stray dogs’. One of her best experience was to be part of Animal Balance, helping raising people’s awareness and consciousness in regards to pet care. Plus, she trained local people to be dog trainers so that her work is sustainable. She was one of the trainers of the Humane Society of Broward County during 2005-2007. Paulina was one of the first trainers Certified as Pet Dog Trainer (CPDT-KA) by the Association of Pet Dog Trainers and a AKC Certified Canine Good Citizen (CGC) Evaluator and Instructor. She is also certified in Pet CPR by the American Red Cross.